By Karen Sherry and Margaret Stenz. Brooklyn Musuem. The job of artists is to see the patterns that lie hidden just beneath the surface of things. The visual environment that surrounds us is full of distractions, insignificant details and conflicting messages. Fortunately there are roadsigns pointing the way out of this murky confusion- the paintings by the best artists who've preceded us. I've spent a life time studying their work. It has taught me how to see on a deeper level. And it's an ongoing assignment. Last Saturday I spent the day at the symposium organized around the Delaware Art Museum's new exhibition American Moderns 1910-1960. 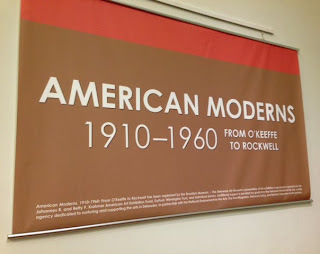 From O'Keeffe to Rockwell, a show that takes an unusual and more broad sample of how modernism influenced American painters in the early 20th century. The work is entirely drawn from the Collection of the Brooklyn Museum with the selections made by Terry Carbone, the Brooklyn Museum's Mellon Curator of American Art. She picked terrific stuff. Heather Campbell Coyle, Delaware Art Museum's Curator of American Art, began the symposium with a slide talk on the history of the DAM's initial forays into exhibiting and later collecting Modernist art in the decades following the groundbreaking Armory Show in New York in 1913. Listening to Heather's presentation it struck me how rarely art museums survey their own history of shows and acquistions. She showed great archival photos of the Museum's galleries in their earlier days. One could feel the unfolding of the Museum's history. Terry Carbone followed with an overview of the Moderns exhibition itself. 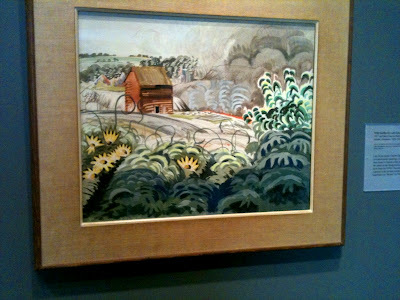 A key point she spoke of was how the arrival of modernism in American art is often over simplified. Traditionally the story is told as if 20th century American art was a one- way street rushing headlong in the direction of abstraction. 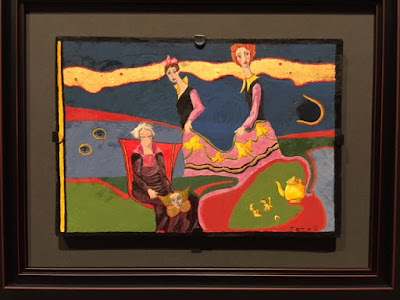 In contrast she showed how the modernist enthusiasms for dramatic two dimensional shapes, more active painting surfaces and the employment of brighter hues made itself felt in all sorts of different styles of 20th century art. As a painter myself who began as an abstract artist before committing to painting the landscape, this broader interpretation of "modernism" makes a lot of sense. In my own landscape paintings I see the echoes of my early painting mentors- the flat design of Frank Stella and the intense color in Mark Rothko coexisting with a love of Thomas Cole and Winslow Homer. 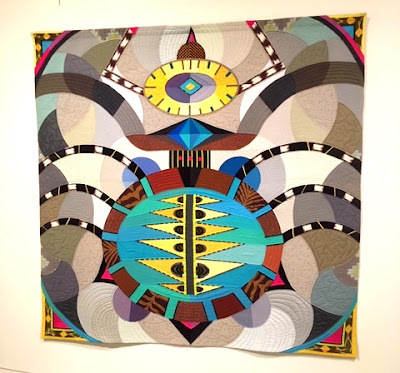 All of us are complex beings, woven together from threads that come to us from all directions. I wanted to talk about several of the paintings in the Monderns show. I'll start with this one below and touch on others in my next blog post. 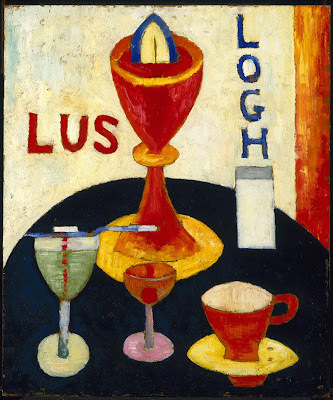 Karen Sherry (formerly from the Brooklyn Museum and now a Curator at the Portland Museum of Art in Maine) who wrote the exhibition catalogue for the show describes Marsden Hartley (Am. 1877-1943) as "A restless spirit with boundless creativity, Hartley experimented with diverse expressive means throughout his career." If one knows his brushy and expressionist later work, this oil Handsome Drinks from 1916, early in his career, shows him when he favored a more pristine and sharp edged way of seeing. Hartley's eye for crisp patterns and high contrasts in his colors is evident. What makes the painting so good, despite the obvious and dramatic contrasts between its colors and elements, is all the different forms seem to want to be seen together. Hartley was a painter deeply sensitive to how he handled his materials. For example, look at the blue lettering in the upper right hand corner. 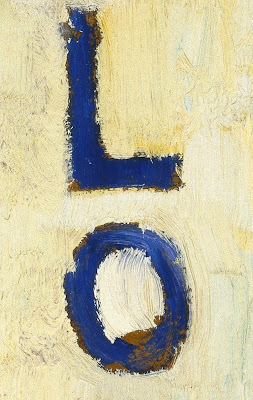 A lesser painter would have painted in the white background, left it to dry, and then plunked down the "L" and the "O". Not here. If one looks closely along the edges of the letters, one sees passages where the blue is clearly in on top of the background white. In other places Hartley's brush subtley pulls the wet background white back up over the blue. Instead of one dominating the other, or each ignoring the other, a conversation unfolds between the two. This "dialog of little edges" occurs throughout the painting. 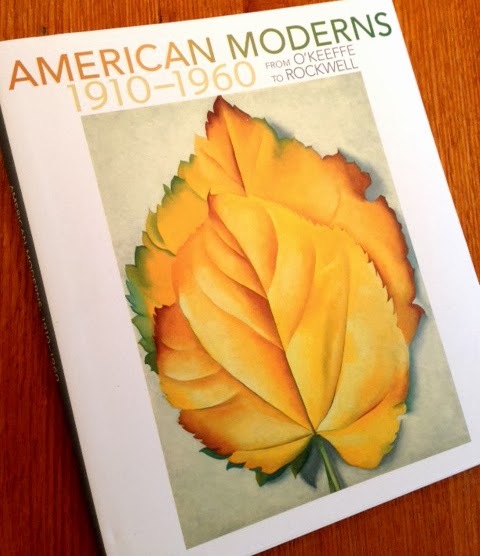 American Moderns 1910-1960. 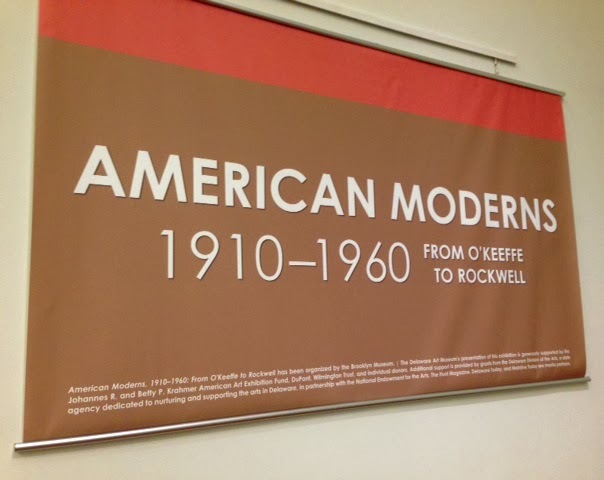 From O'Keeffe to Rockwell continues at Delaware Art Museum through Jan. 5, 2014. 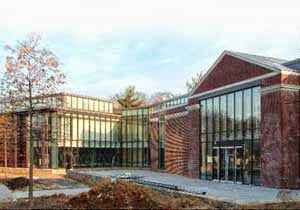 It's tour then takes it to art museums in Winston Salem, NC, Springfield, MA, and Wichita, KS.